How Does Deep Fried Ice Cream Work? 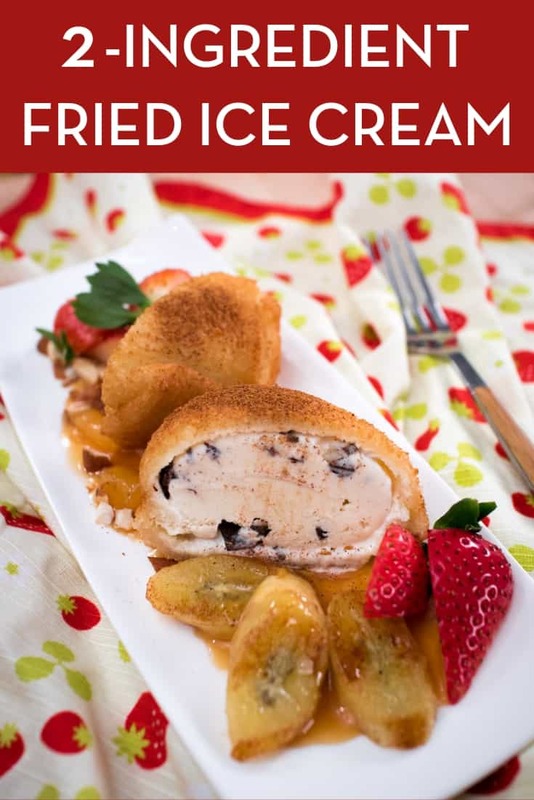 Deep fried ice cream is a wonderful oxymoronic recipe. How can ice cream be deep fried without melting? There are many ways to do deep fried ice cream, but the principles are all the same. You wrap or coat a scoop of ice cream in a crust of some sort, then you freeze the whole thing until it is as cold as it can possibly be. You then fry the ice cream in high heat for a very short time so the crust will brown and crisp before the ice cream has a chance to melt. Et voila! So there are 3 keys to this: 1) The crust has to be something that brown very quickly. 2) The oil has to be hot enough. 3) The ice cream has to be very cold. 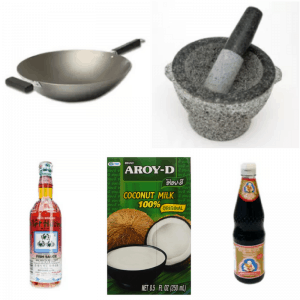 In this recipe I show you the Thai way of doing it, which happens to be the easiest, simplest way I’ve ever seen. Two ingredients: sandwich bread and ice cream. I discovered this method when I worked as a server at a Thai restaurant (way back when I was a university student). It was a very popular dessert at this restaurant, and when I saw how they made it in the kitchen I was equally shocked and delighted at how easy it was! *Extra Goodies for Patreon Members: In this episode’s “Show After The Show” I share with you a quick recipe that uses the leftover bread crusts which you will have from this recipe, and how to turn it into yummy little sweet treats! Also, I’ll share an idea for another snack my mom used to make using plain sandwich bread. Click here to find out more about becoming a Patreon member! Scoop out ice cream into balls and place on a plate; freeze for at least 30 minutes to firm up. Tip: If you want to fold other ingredients into the ice cream, such as chopped chocolate or cookie bits, scoop ice cream into a pre-frozen ceramic bowl, then quickly stir in mix-in ingredient and reshape into a ball. Freeze for at least 30 minutes or until firm. Trim crust off of the bread, making sure you trim off enough that there aren’t any denser part of bread left on (see video). Roll bread out with a rolling pin to flatten slightly. You may need to roll out the edges more to get them to flatten. To wrap ice cream: Have a 12-inch sheet of plastic wrap ready on a work surface. Place the firmed ice cream on top of a piece of bread and bring the edges up around ice cream. Place the other piece of bread on top, matching corners of the top piece with “valleys” of the bottom piece. Press bread around the ice cream, making sure there are no uncovered areas (it won’t stay wrapped at this point, don’t worry). Wrap the whole thing in plastic wrap tightly, bringing corners up and twisting the wrap to secure bread onto ice cream. You want this tight! Freeze for at least 6 hours. Note: You may be able to get away with less time, but I have never tried frying ice cream that has been frozen for less than 6 hours, so I don’t know what the true “minimum” is. This will also depend on how cold your freezer is. While ice cream freezes, prep sauce and toppings. 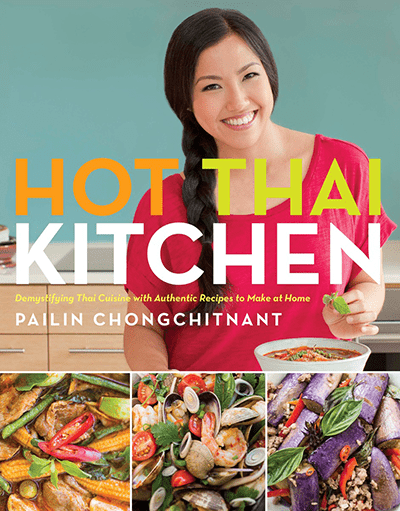 Heat palm sugar over medium heat in a small pot or a saute pan until melted, stirring frequently. Once melted, keep heating and stirring until it caramelizes into a dark amber colour. Add coconut milk (it will bubble aggressively) and pineapple juice. Keep cooking until the sugar dissolves and sauce has reduced into a thin caramel sauce consistency. Add the pineapple pieces and cook for 2-3 more minutes in the sauce, stirring occasionally. Let cool before serving. It will thicken a bit more once cooled. Add enough oil to a small pot so that it will keep the whole ice cream ball submerged. Heat the oil to 375°F. It is important that you are sure the oil is hot enough. If the oil is too cold the bread won’t brown fast enough and the ice cream might melt. Too-cold oil would also result in an oily crust. I recommend using a deep fry thermometer. Fry the ice cream just until golden brown, this should take about 30 seconds only, and no more than 40 seconds. Any flavour ice cream will work for this. Also, you can mix in other ingredients to create more interesting flavour combinations, for example: red bean paste in matcha ice cream, cookie pieces in vanilla ice cream, or cheese cake pieces in strawberry ice cream. Choose bread that is not too thick (see thickness in video) and make sure it is a square shape. I find bread from Asian bakeries work best for this as they tend to be square shaped and has the right thickness. Avoid bread with a “mushroom top” shape, as the irregular shape will make it harder to wrap.